Jesse Cook knows what he wants - to join the new mounted regiment being raised in his hometown in Kentucky. It’s 1864. The War of Rebellion is nearing its dramatic conclusion, with his side on top. There’s a hefty bounty being offered to every man accepted into the army. That money will serve Jesse well when he marries his sweetheart Eliza. Inspired by the life of an actual veteran of the Civil War: Corporal Jesse J. Cook, Co. B, 53rd KY. This is the second audiobook in the Toe the Mark Civil War Series. Based on military records from the National Archives, regimental records, historical newspaper accounts, and genealogical research. 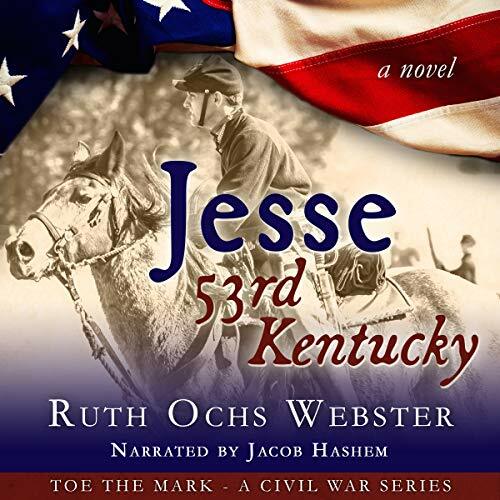 I was pleasantly surprised with how the Civil War is presented in the book, Jesse, 53rd Kentucky by Ruth Webster. We all know how the Civil War ends but the way the information is provided through the lens of the story’s humble characters was so refreshing. All the research and fact gathering that obviously took place was brought to life with good character development and believable dialogue. It is the story of farm families who are forced to endure atrocities beyond their imaginings; ready to endure all for the things they believed in. I felt a warmth for the wonderful, everyday people who are now part of my own heart. A great story written beautifully by Ruth Ochs Webster. Not being an American I never learnt much about the Civil War in my country Australia, only through Hollywood. Ruth brings the message home through normal people thrust into a shocking predicament, war. The story is expertly written and I could feel the plight of the characters, Jesse in particular throughout the tale. The narration is first class, I enjoyed the slight nuances that Jacob Hashemite brought to the different characters in the book, sometimes subtlety. I was given this book for free in return for an honest, sincere review. I highly recommend this book for history buffs and non history buffs, the tale is enjoyable, the characters believable and instantly likable.